Welcome to Hidden Fence Systems web site. We appreciate the opportunity to introduce ourselves and our product to you and your family’s best friend, “your pet.” Previously your options to contain your pet were to either physically fence your grounds or chain your dog up. Neither option was one our family wanted. After checking into an electronic pet containment system and seeing how versatile the product is, I decided this amazing product was the solution for other pet owners as well. As an authorized dealer/installer, covering the entire State of Mississippi, in 1992, I started Hidden Fence Systems, Inc.
With thousands of Hidden Fence Systems installed Mississippi and Louisiana, our “best friends” now have complete “contained freedom.” No more chains, costly maintainence of physical fencing, or not having to go out for walks late at night before bed time, in the rain and the cold. Your pet is able to run and play safely within its secured area on your property—in regular size lots or acres and acres of property, as well as in lakes for those water loving pets. We are now celebrating 22 years of keeping thousands of dogs of all sizes and breeds safe from harm. Veterinarians have recommended this method of containment for many of their customer’s pets. SIGNAL TYPE: 7K & 10K DIGITAL MULTI ZONE TECHNOLOGY – AS CLOSE TO MILITARY RESTRICTED FREQUENCIES AS POSSIBLE. THE LOWER THE FREQUENCY THE BETTER THE SYSTEM PERFORMS. FM FREQUENCIES TEND TO AFFECT GARAGE DOOR OPENERS AND OTHER WIRELESS ELECTRONIC DEVICES IN YOUR HOME AND CAN’T CARRY A RADIO SIGNAL THROUGH BOUNDARY WIRE AS FAR AS LOWER RADIO FREQENCIES. MULTIPLE ZONE CORRECTION LEVELS WITH RUN THROUGH PROTECTION. OTHER SYSTEMS OFFER BELLS AND WHISTLES THAT KICK IN AFTER THE DOG HAS LEFT YOUR PROPERTY. OUR SYSTEM STOPS THEM FROM LEAVING YOUR PROPERTY. THAT’S THE DIFFERENCE! RECEIVER COLLAR CORRECTION LEVELS ARE EASILY ADJUSTABLE ON OUR TRANSMITTER. CORRECTION LEVELS CAN BE SELECTED IN A RANGE FROM ZERO UP TO 12OOO VOLTS. OTHER SYSTEMS CAN ONLY ADJUST THE FREQUENCY OF CORRECTIONS BUT NOT THE CORRECTION LEVEL ITS SELF. THEY NEVER TELL YOU THE ACTUAL CORRECTION LEVELS OF THEIR SYSTEMS BECAUSE THEY DON’T KNOW. THEY REFER TO INTERVALS BETWEEN CORRECTIONS. LOW CORRECTION LEVELS EQUATE TO LONGER BATTERY LIFE AS BRAGGED BY SOME SYSTEMS. WIRELESS TRANSMITTERS FOR INDOOR USE AND OUT DOOR SHRUBERY PROTECTION, ETC. WIRE: WE USE THE HIGHEST GRADE COPPER STRAND WIRE WITH A 45 MIL POLLY COATING THAT IS MADE TO BE BURRIED RATED 60 YEARS. OUR COMPETITORS USE A MUCH INFERRIOR WIRE THAT STARTS TO DEGRADE ALMOST IMMEDIATELY. REACTION TIME OR CORRECTION RESPONSE AFTER AUDIBLE WARNING IS RECEIVED:WE OFFER TWO TYPES, AUDIBLE WARNING AND CORRECTION SIMULTANEOUSLY OCCUR, AND TIME BASED WHERE AFTER THE AUDIBLE WARNING OCCURS THE CORRECTION IS INTRODUCED WITHIN 3 SECONDS TO STOP YOUR DOG. 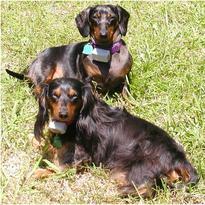 INDIVIDUAL CORRECTION LEVEL SETTINGS CAN BE MADE FOR EACH OF YOUR PETS AS MAY BE REQUIRED. Contact us for a free no obligation consultation regarding your pet containment needs. Our prices will be more than competitive and the Dog Guard System is the highest quality available on the market. Our top goal is your pet’s safety! As a veterinarian tested, approved and recommended Pet Containment System, Dog Guard has long been known for the high quality reliability of our American-made products.